IFTA AWARD winning director Niall Heery’s latest film Gold is a wonderfully well worked comedy-drama set in rural Ireland. Heery’s last film, Small Engine Repair, with Iain Glen, debuted at the 2006 Galway Film Fleadh and was a sign of his immense talent. It has been far too long but he is back again and with another Game Of Thrones alumni. After stealing the show in the star studded Calvary in April, Gold finds David Wilmot as hapless absentee father Ray, who has struggled with depression and previously spent time in a psychiatric hospital after attempting suicide. 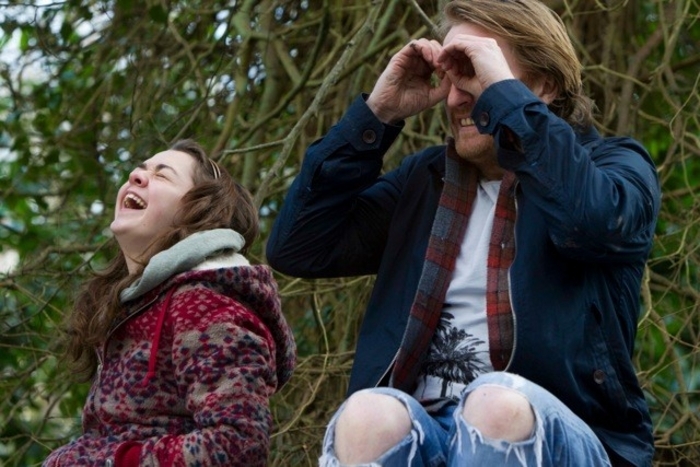 Ray is back in his hometown to spend some time with his terminally ill father and to see his estranged daughter Abbie (Maisie Williams ) and attempt to establish a relationship with her. He appears outside the house of his old family armed with a 10-year-old letter, written by his ex-girlfriend Alice (Kerry Condon ), which says he can drop in any time. Alice has since married Frank (James Nesbitt ), Ray’s old PE teacher, who is not happy to see Ray, a student he had little time for. Frank’s bullying of Ray doubtless played a part in his mental breakdown 12 years ago. Abbie mistrusts her father for leaving her and does not want anything to do with him, but when an accident befalls Frank and Ray is there to help save him she slowly begins to come around. With Frank out of the way a relationship grows between the Ray and Abbie. Alice also begins to warm to Ray and eventually rediscovers her old feelings. It’s not long before it all comes crashing down around Ray with comedic and indeed poignant results. One of the more refreshing aspects of Gold is how it tackles the difficult issue of suicide. Ireland sadly has one of the highest rates in Europe for male youth suicide, so it is good to see an Irish film deal with a problem we have all been touched by, but which is often ignored by the indigenous film and TV industry. Heery treats the subject with great sensitivity and respect. When Abbie is asked by her friend if she will inherit her father's depression and suicidal tendencies, this deeply worries her. It shows the importance of an open dialogue with young people about depression and how hard it is to know what is going on inside the head of a teenager. Heery is a gifted director, capturing a small town Ireland we all recognise. Gold very easily moves from comedy to drama and it is to the director's credit we never find this jarring. He makes great use of his fantastic cast with Wilmot and Williams (with a pitch perfect Irish accent ) standing out. Couple this with a great soundtrack (I’m dismayed it is not on iTunes ) and you have one of the best Irish movies of the year.